The Durban International Blues Festival will celebrate this year’s event with a new format. The organisers have recognised the fact that, for the ticketed evenings, a venue with more capacity is needed than that of the traditional venue, Zack’s at Wilson’s Wharf. “For this reason, ticketed concerts will take place at the University of KZN’s popular Elizabeth Sneddon Theatre, whilst the non-ticketed (free) evenings will continue at Zacks, Wilson’s Wharf as it has for the last decade,” says Festival Director Themi Venturas. “Blues” lovers can enjoy the first concert on October 28 which is entitled Wailin' Blues and features the international guest artist from Chicago, USA –Khalif Wailin’ Walters. Walters is one of the Chicago Blues music scene’s next generation and he brings to the stage his own unique style of funk infused boogie blues. Calling the European market his home base now, Khalif “Wailin’” Walter’s stormy guitar work and brash New Orleans style vocals surely define his sound which is reminiscent of the greats like Albert King, Otis Rush and Albert Collins. 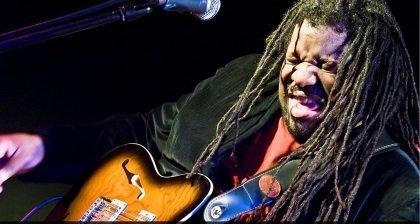 Fusing contemporary style and innovative original arrangements, Khalif “Wailin“ Walters delivers foot stomping, finger snapping Blues that sets the roof on fire. The second ticketed evening on October 29 will be The BB King Blues Summit which is a tribute show incorporating the blues festival’s traditional Blues Summit and which sees some of the ‘best of the fest’ mixed with a tribute to the late and great blues legend, BB King. This tribute show will feature Durban’s ever popular The Reals as the backing band for the performance and will include a variety of music from the life and history of this great blues master.